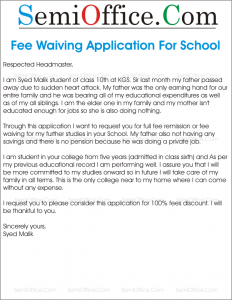 Sample application for requesting full fee waive off from school, college, academy or institute because the death of your father or any guardian who was paying your educational fees. You can write this application for full fee remission or waive off the full fee from school or college. This is also known as “fees maafi application in English” etc. This application is to request a fee waiver for three months. Due to death of my father I am unable to pay college dues as there is no other way of earning for our family. I had always been a brilliant student and I strongly want to continue my studies in your institute. It would be grateful to waive my tuition fees for three months. I am sure you would consider my application at your foremost. I am Syed Malik student of class 10th at KGS. Sir last month my father passed away due to sudden heart attack. My father was the only earning hand for our entire family and he was bearing all of my educational expenditures as well as of my all siblings. I am the elder one in my family and my mother isn’t educated enough for jobs so she is also doing nothing. 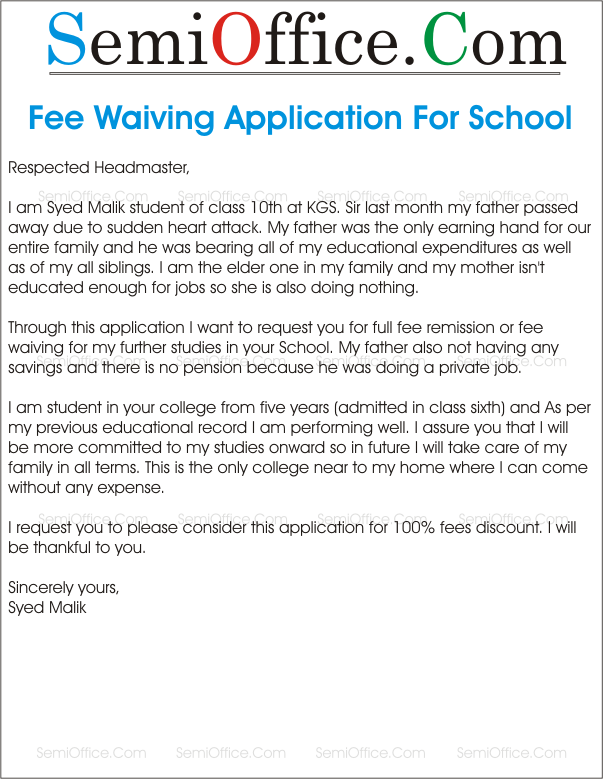 Through this application I want to request you for full fee remission or fee waiving for my further studies in your School. My father also not having any savings and there is no pension because he was doing a private job. I am student in your college from five years (admitted in class sixth) and As per my previous educational record I am performing well. I assure you that I will be more committed to my studies onward so in future I will take care of my family in all terms. This is the only college near to my home where I can come without any expense. I request you to please consider this application for 100% fees discount. I will be thankful to you. I am student of MBA(Marketing) at COMSATS University with CGPA of 3.8 in 2nd semester and excellent educational record at department level. Last week my father passed away in a road accident and he was the only one in my family supporting my education as well as education of my siblings. He was a salaried person and bearing all the expenses from his monthly salary. Now there is no one to bear my educational expenses and I request you to please consider my application for at least 50% fees discount for next 4 semesters.